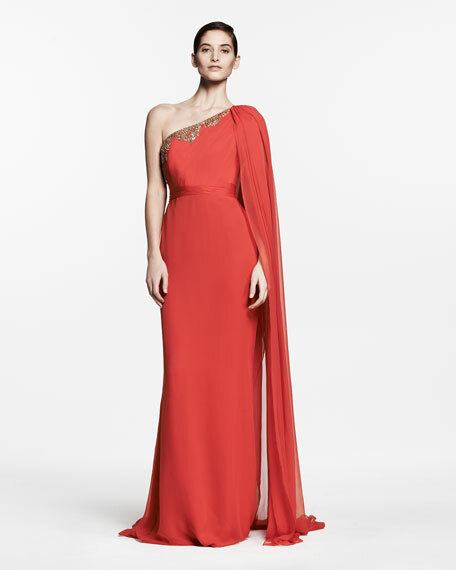 Stand out beautifully at your next black-tie affair with this one-shoulder gown by Notte by Marchesa in mirthful poppy. There's no need for a necklace with the twinkling, bead-encrusted neckline. 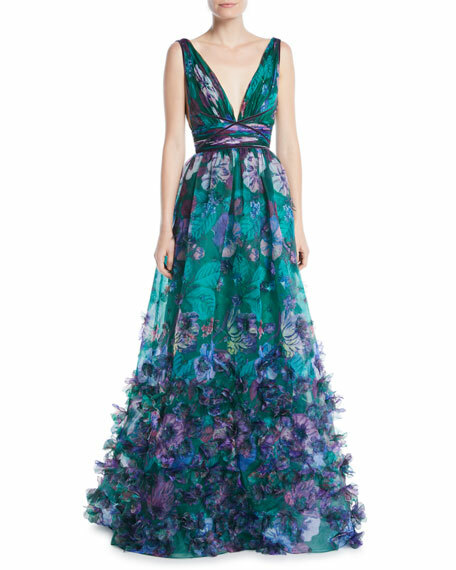 Notte by Marchesa silk chiffon gown. Approx. 62"L front, 66"L back from shoulder to hem (4"L train). Long sash drapes behind left shoulder. Embellished top with open back. Long skirt with back godet detail. Shoulder sash and train pool at floor. A great partnership was born when best friends Georgina Chapman and Keren Craig met in college. 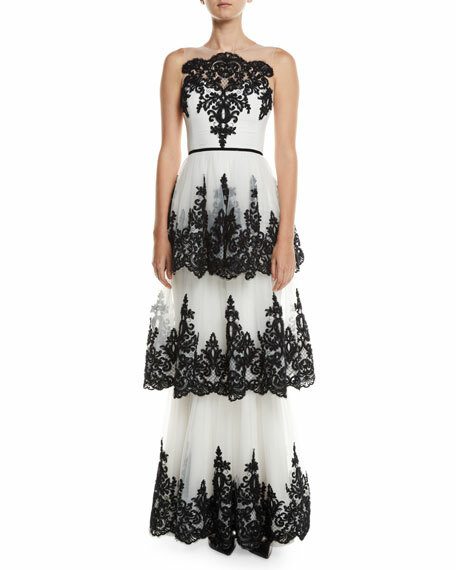 A few years after graduating and working in separate fashion fields, they created Notte by Marchesanamed after the eccentric '20s society icon Marchesa Luis Casati. Their vintage-inspired designs make the line a celebrity and socialite favorite. 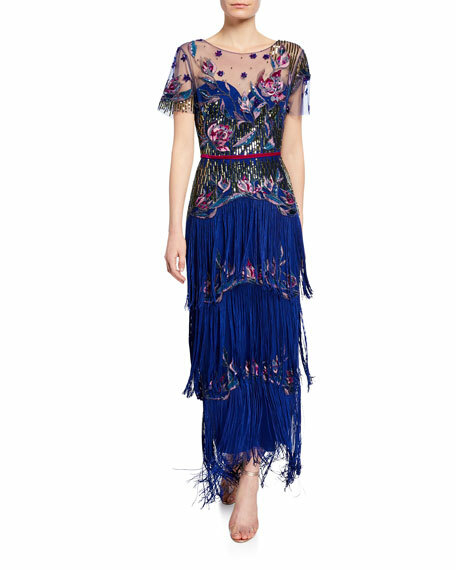 Marchesa Notte tiered fringe gown embellished with sequins and floral embroidery. 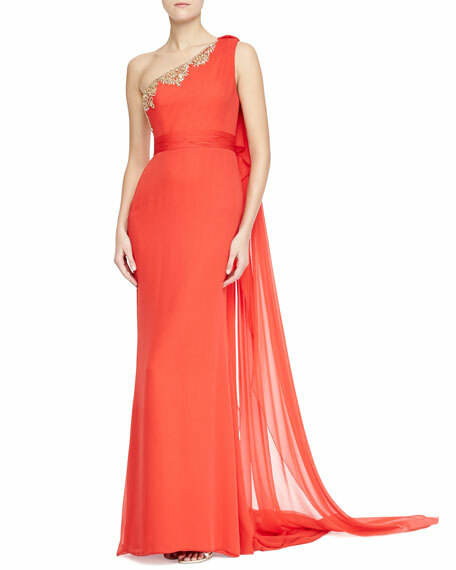 Bateau neckline with sweetheart illusion; keyhole back. Short sleeves. Banded waistline. Column silhouette. Full-length. Fringe hem. Hidden back zip. Polyester, self/lining. Imported. Exclusively ours. 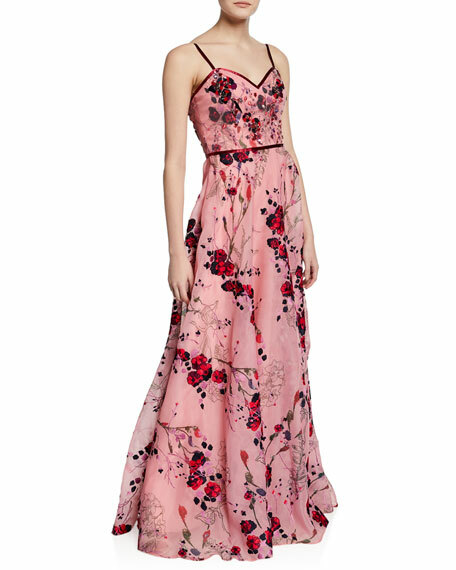 Marchesa Notte floral-printed organza gown with floral embroidery, beaded bodice, and contrast trim. Sweetheart neckline. Sleeveless; adjustable straps. A-line silhouette. Floor-length hem. Hidden back zip. Polyester. Imported.